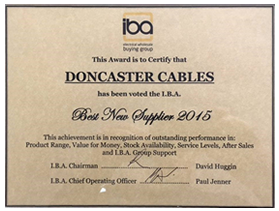 At the IBA annual dinner held on Thursday March 17th Doncaster Cables were named as 'The Best New Supplier 2015'. This award is given in recognition of outstanding performance in product range, value for money, stock availability, service levels , and after sales and support to the IBA Group. Terry Guest a director at Doncaster Cables said that "All at Doncaster cables were pleased to have received this prestigious award. We take great pride in supplying our customers with top quality cables manufactured here in the UK together with first class levels of service. This award recognises the team effort of all our employees here in Doncaster whether that be at the manufacturing stage, distribution, technical assistance, and or service departments." Our aim at Doncaster Cables is to continually improve our manufacturing operation here in the UK and to maintain our high level of service to our customers. In these difficult times where we are constantly competing against often inferior imported products which in many cases do not conform to the required British or European Standards. It is a great boost to see our efforts recognised in this way. Doncaster Cables has gone through major changes as a cable manufacturing company throughout the past 3 years when it became a completely independent operation. This has seen it take on a new marketing approach supplying independent wholesalers throughout the UK. We would like to thank the IBA and its members who have helped our company grow during this very difficult time. Doncaster Cables Company Video - How do we make cables?